So, moving on. I've decided that I need something else to draw, something fun and something that might last a while. While reading through my RSS feeder this morning I realized that there was plenty here to draw. So for a while I will be doodling my favorite characters from the various web comics I read. Maybe it will help expose you all to new ones you might not know of. So going in the order in which they are displayed in my reader the first up is Happle Tea by Scott Maynard. Do you like mythology? Of course you do, who doesn't... Then this comic might just make you laugh. Mostly revolves around Lil K and his dad, Sasquatch. Lil K meets all kinds of folks from all kinds of myths and legends. One of my favorite returning characters is Cat God. 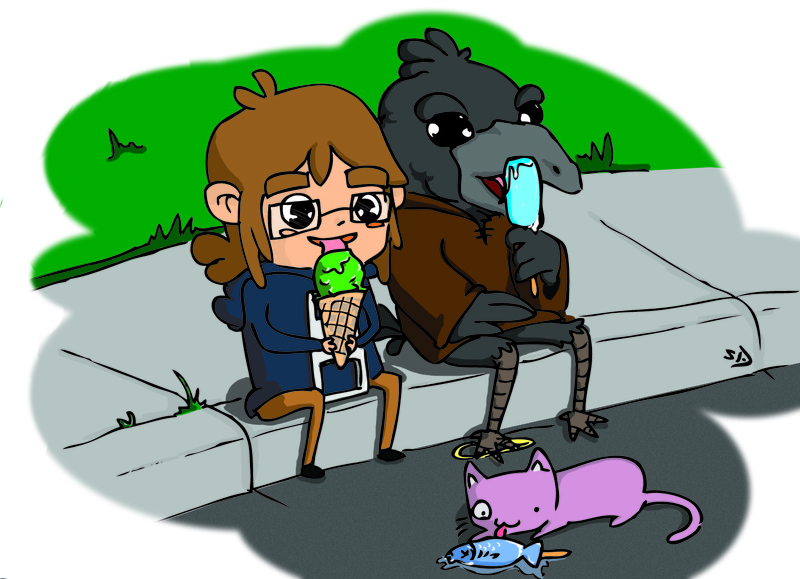 So I started out drawing Lil K eating ice cream because it is summer and I wanted him to have a nice time with Cat God for once, who generally says some unpleasant things. Then, since I am obsessed with Kenku, which are loosely based off karasu tengu from Japanese mythology, I thought hey, lets add a kid one in. Who else better might hang with a kid Kenku then Lil K, plus they have similar fashion sense in they are always shown wearing hooded clothes. 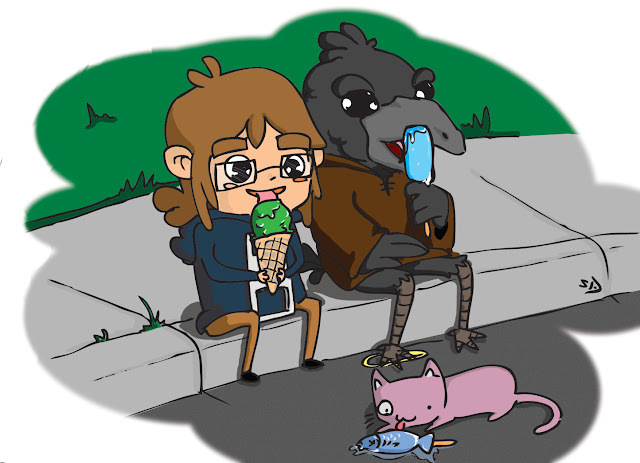 :) Not sure what type of ice cream truck would have frozen treats to appeal to all three, but I bet it would exist in this comic.